Jurgen Klopp gave a mixed injury update and urged supporters to “shout your soul onto the pitch” ahead of Saturday’s visit of Bournemouth. The Reds host the Cherries this weekend, looking to end a slight dip in form that has seen Leicester and West Ham earn back-to-back draws. The dropped points have seen champions Man City seize their opportunity, going top of the Premier League on goal difference. 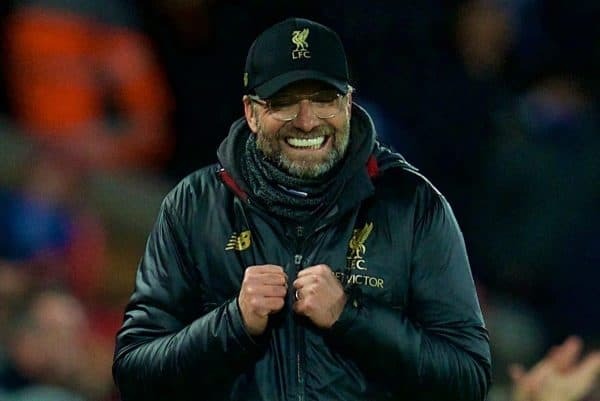 Destiny is still in Liverpool’s hands, however, and despite some questioning Klopp’s current mood under pressure, he was in typically relaxed form on Friday. Speaking at Melwood, the Reds boss urged the home fans to produce an atmosphere that inspires his players to a crucial victory. “Everybody who saw matches in the past knows how big an influence atmosphere is,” Klopp said. “I don’t know if I have to ask for it, but whoever wants us to succeed in this game, and in general wants to help, I don’t have the English saying for it, but it’s like shouting your soul onto the pitch. Liverpool’s injury prognosis was a mixed one, with Trent Alexander-Arnold, Jordan Henderson and Gini Wijnaldum all back in training and in contention for Saturday’s game. Joe Gomez is expected to return in the next month or so after surgery on a broken leg this week, but Dejan Lovren is still sidelined. Klopp touched upon the return to Anfield of Dominic Solanke, who could start for Bournemouth due to Callum Wilson’s absence. It may have never worked out for the young striker at Liverpool, but his former boss is looking forward to seeing him. “He’s a wonderful guy, a big talent. We couldn’t give him enough match time, now he got his first start last week,” he added. Also on the agenda was Liverpool’s loss of ground on City, for which Klopp simply said, “it’s getting exciting now. It was always clear that it would be tight until the end”. Victory for the Reds this weekend puts the pressure back on Pep Guardiola’s side, who host Chelsea on Sunday afternoon.